Golf is a good walk spoiled, according to both proponents and detractors. It isn't just the outrageously fickle game that takes abuse, the golf courses, known for their calm scenic views and precise grass patterns, get hammered every day as well. Divots created by golf strokes are common and can be a costly problem for golf course maintenance operations. Although previous research has identified differences in divot recovery across species of bermudagrass and zoysiagrass, little has been developed about actual divot resistance. Scientists at Purdue University and the University of Arkansas evaluated 12 cultivars of bermudagrass and zoysiagrass in a field experiment conducted in Fayetteville, Arkansas. Two golfers each hit three golf balls on each plot. The divots created by their shots were rated visually for divot type and severity, and the volume of displaced soil was measured. The primary objective of this experiment was to quantify the divot resistance for various turfgrass cultivars. 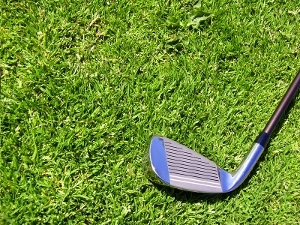 Researchers also compared evaluation methods for quantifying divot resistance. 'Riviera' bermudagrass allowed the largest volume per divot, while the smallest divots were observed with 'Cavalier', 'Diamond', and 'Zorro' zoysiagrass. The four methods used to evaluate divot resistance provided similar findings among the different grass cultivars and species tested. "Due to the ease and speed as well as lower measurement variability of evaluating divot resistance, a visual rating for divot severity or a Turfgrass Shear Tester are recommended for future work in divot resistance," explained Jon Trappe, a Purdue professor and the author of the study. The results from this study demonstrate the differences and similarities in divot resistance that exist among various grass cultivars. Cultivars that are more resistant to divoting can help reduce maintenance inputs and costs. The research also demonstrates the need for evaluating the combination of resistance and recovery of divoting, as some grass cultivars have both improved resistance and recovery. This research was partially funded by the Arkansas Turfgrass Association and the Golf Course Superintendents Association of Arkansas.